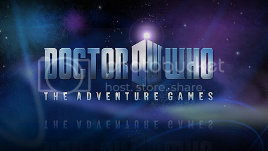 Kicking off immediately after the cliff-hanger ending of episode three, the latest Adventure Game picks up the story of the Doctor and Amy who've materialised just south of London (and about a 1000 miles to the left), inside a sea-bed colony called Poseidon. Shadows of the Vashta Nerada features a cracking plot which surrounds a real-world conspiracy and, of course, it takes place at Christmas. Steven Moffat, executive producer and lead writer for Doctor Who: "We've gone all-out for the season finale. Shadows of the Vashta Nerada takes place entirely underwater - something which would be impossible for the TV series, as water is so expensive. It's thrilling, terrifying, educational and fun. Just steer clear of those shadows..."
As one might expect from the title, the storyline will feature the return of the shadowy Vashta Nerada, previously 'seen' in the Moffat-penned episodes from Series Four, Silence in the Library and Forest of the Dead. As we reported in September, Season Two of The Adventure Games is expected to come out sometime next year, developed by the same team as with the current games. The news came as part of the BBC's 2010 Adventure Calendar, where you can also download festive wallpaper featuring the Doctor and Amy as part of Day Two in the run-down to Christmas.